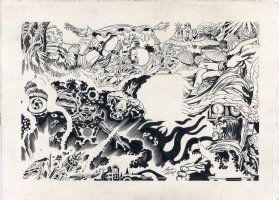 Jack Kirby is THE quintessential comic book artist of all time. Annointed the King by fans and professionals alike, Kirby elevated the artform and is the measure for everything since. 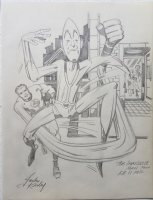 An imaginative talent of the highest magnitude, much of the Marvel Universe, the Fourth World, the Romance comics genre, and many more were created by Kirby. Every fight scene and every moment of humanity were captured just perfectly to bring the audience along for the adventure, the thrill, the sorrow, and the joy. 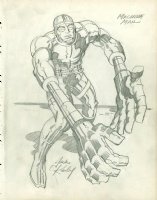 Besides artwork, Kirby was also admired for his dedication to the fans. 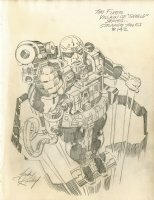 From attending the earliest of conventions to sketching for the fans, Kirby made time to make sure that every person felt as if they were the King. 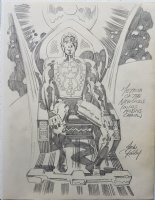 While he is sorely missed, the Kirby legacy lives on in the characters and their ideals, the comic book stories we treasure, the original artwork we collect, the memories we share, and the inspiration he gives to all who follow. HUGE concept pencil art MIGHTY MAGON! New Gods - Black Racer Title Page! 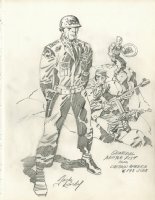 z-Skymasters Sunday Panel - Wally Wood inks!